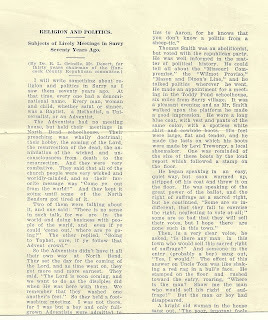 As I was going through some old papers, I found this one-page (but a long page, too long for my scanner in one shot) article by Dr. R. L. Grindle, Mount Desert, Maine, who was chairman of the Hancock County Republican committee for thirty years. He talks of events 70 years in the past, and mentions anecdotes from 1854 and 1855 specifically, so I believe he wrote the article in the 1920s. Some of his observations made me wince. 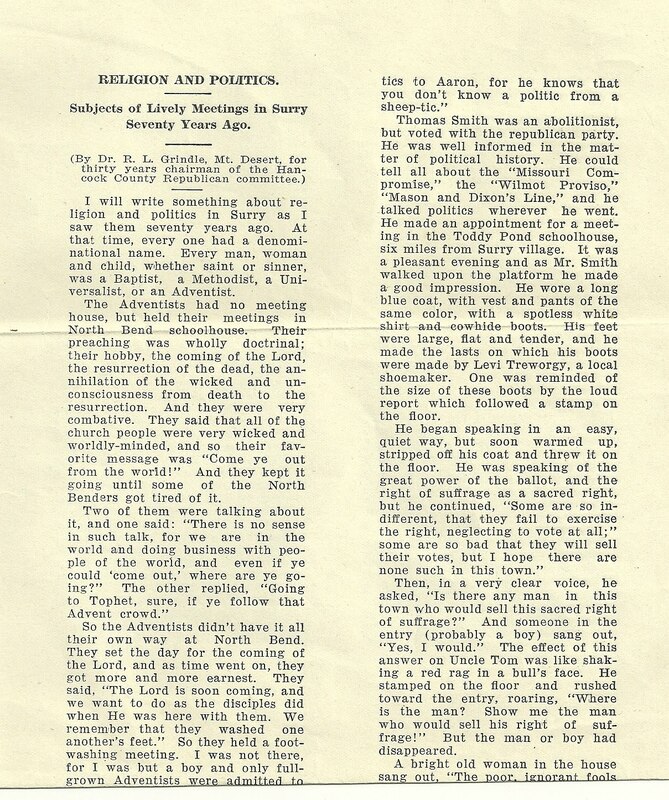 I will write something about religion and politics in Surry as I saw them seventy years ago. At that time, every one had a denominational name. Every man, woman and child, whether saint or sinner, was a Baptist, a Methodist, a Universalist, or an Adventist. The Adventists had no meeting house, but held their meetings in North Bend schoolhouse. Their preacing was wholly doctrinal; their hobby, the coming of the Lord, the resurrection of the dead, the annihilation of the wicked and unconsciousness from death to the resurrection. And they were very combative. They said that all of the church people were very wicked and worldly-minded, and so their favorite message was "Come ye out from the world!" And they kept it going until some of the North Benders got tired of it. Two of them were talking about it, and one said: "There is no sense in such talk, for we are in th world and doing business with people of the world, and even if ye could 'come out,' where are ye going?" The other replied, "Going to Tophet, sure, if ye follow that Advent crowd." So the Adventists didn't have it all their own way at North Bend. They set the day for the coming of the Lord, and as time went on, they got more and more earnest. They said, "The Lord is soon coming, and we want to do as the disciples did when He was here with them. We remember that they washed one another's feet." So they held a foot-washing meeting. I was not there, for I was but a boy and only full-grown Adventists were admitted to this meeting. Two men who attended the meeting, were noted for the size of their boots. Some people laughingly said, "It must have been something of a job to wash those four feet." As the appointed day drew near, the Adventists talked to nothing but spiritual things. They said, "We remember those foolish virgins who had no oil in their lamps when the bridegroom came, and we do not want to be like them, so we must watch and pray." So they held meetings in the afternoon and evening, and they talked and prayed and sang. Their favorite hymn was "We are going home, to die no more, We are going home, in fifty-four." But when the day came and passed like other days, the Adventists were much disappointed. Parker Wood, who took little stock in Adventism, said "You sang, 'we are going home in fifty-four', but you didn't go. But that was a good tune, and you'd better keep right on singing it, but sing it, "We are going home in fifty-five, dead or alive,' and then, if the Lord won't come, you an jump overboard." The people of other denominations were equally active, and I have much to write about them sometime, but not now, because I want the space in which to write something about Surry politics. The people of Surry were much interested in politics, as well as religion. They held political meetings and talked politics in the fields, in the stores, and on the streets. Orrin P. Carter lived at the Toddy Pond district. Asa and Mary were the names of his father and mother, and they were very strong democrats. But Pearl was a republican. He could write a good article for a paper, and had quite a gift for public speaking. Democrats, generally, did not like him. Going to and from Surry village he passed the house of Aaron and Rhoda Kitfield, who were democrats. One day he called and asked for Aaron. Aunt Rhoda said, "What do you want of Aaron?" Pearl said, "I want to talk politics with him." Aunt Rhoda looked at him and said, "It is no use for you to talk politics to Aaron, for he knows what you don't know a politic from a sheep-tic"
Thomas Smith was an abolitionist, but voted with the republican party. He was well informed in the matter of political history. He could tell all about the "Missouri Compromise," the "Wilmot Proviso", "Mason and Dixon's Line," and he talked politics wherever he went. He made an appointment for a meeting in the Toddy Pond schoolhouse, six miles from Surry village. It was a pleasant evening and as Mr. Smith walked upon the platform he made a good impression. He wore a long blue coat, with vest and pants of the same color, with a spotless white shirt and cowhide boots. His feet were large, flat and tender, and he made the lasts on which his boots were made by Levi Treworgy, a local showmaker. One was reminded of the size of these boots by the loud report which followed a stamp on the floor. He began speaking in an easy, quiet way, but soon warmed up, stripped off his coat and threw it on the floor. He was speaking of the great power of the ballot, and the right of suffrage as a sacred right, but he continued, "Some are so indifferent, that they fail to exercise the right, neglecting to vote at all;" some are so bad that they will sell their votes, but I hope there are none such in this town." Then, in a very clear voice, he asked, "Is there any man in this town who would sell this sacred right of suffrage?" And someone in the entry (probably a boy) sang out, "Yes I would." The effect of this answer on Uncle Tom was like shaking a red rag in a bull's face. He stamped on the floor and rushed toward the entry, roaring, "Where is the man? Show me the man who would sell his right of suffrage!" But the man or boy had disappeared. A bright old woman in the house sang out, "The poor, ignorant foots don't know any better; they don't know what they are talking about." This seemed to quiet Uncle Tom for he returned to the platform and continued his speech to the end with no further interruptions. 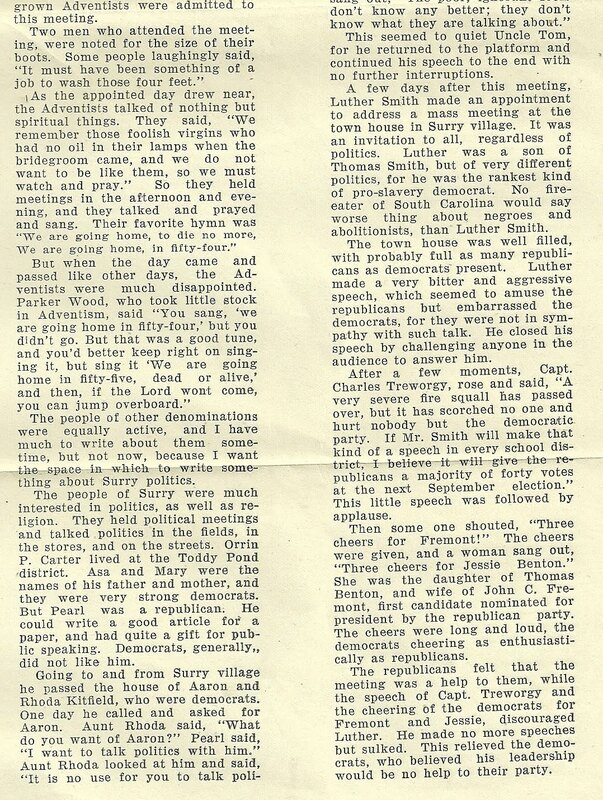 A few days after this meeting, Luther Smith made an appointment to address a mass meeting at the town house in Surry village. It was an invitation to all, regardless of politics. Luther was a son of Thomas Smith, but of very different politics, for he was the rankest kind of pro-slavery democrat. No fire-eater of South Carolina would say worse thing about negroes and abolotionists, than Luther Smith. The town house was well filled, with probably full as many republicans as democrats present. 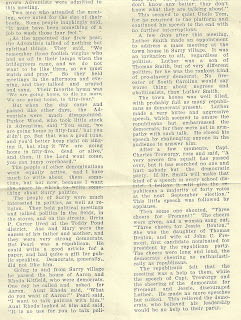 Luther made a very bitter and aggressive speech, which seemed to amuse the republicans but embarrassed the democrats, for they were not in sympathy with such talk. He closed his speech by challenging anyone in the audience to answer him. After a few moments, Capt. Charles Treworgy, rose and said, "A very severe fire squall has passed over, but it has scorched no one and hurt nobody but the democratic party. If Mr. Smith will make that kind of a speech in every school district, I believe it will give the republicans a majority of forty votes at the next September election." This little speech was followed by applause. Then some one shouted, "Three cheers for Fremont!" The cheers were given, and a woman sang out, "Three cheers for Jessie Benton." She was the daughter of Thomas Benton, and wife of John C. Fremont, first candidate nominated for president by the republican party. The cheers were long and loud, the democrats cheering as enthusiastically as republicans. The republicans felt that the meeting was a help to them, while the speech of Capt. Treworgy and the cheering of the democrats for Fremont and Jessie, discouraged Luther. He made no more speeches but sulked. This relieved the democrats, who believed his leadership would be no help to their party. I hope you find this article interesting. Thanks for stopping by!